I have to admit, I love the new format of White Dwarf since the switchover. 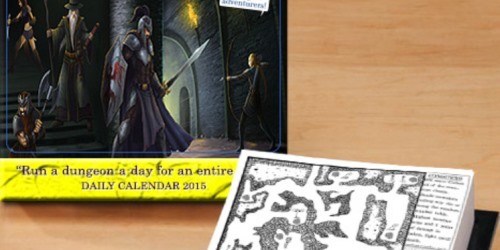 There are well-thought out articles instead of blatant sales pitches, it’s more reasonably priced and the magazine materials are the highest quality out of any gaming publication to date. Sure, the digital version of White Dwarf is perhaps the worst gaming mag available today in terms of layout and ascetics, but maybe someday Games Workshop will get up to snuff in that regard. Now, the last issue I reviewed, #23, I mentioned how after weeks of 40K, the magazine was so focused on the army of the month that I probably wouldn’t pick another issue up until it had armies I played in them so I could actually get something out of the magazine’s content. I made a slightly snide remark that, since my armies were Lizardmen, Bretonnia (can you tell what edition I started with?) and Tomb Kings (along with Guardians of the Covenant for 40K), that it might be months or years before I get another issue, as they seem to be the redheaded stepchild of Warhammer Fantasy. Well, here I am not two months later with Issue #30, which heralds Warhammer: The End Times. 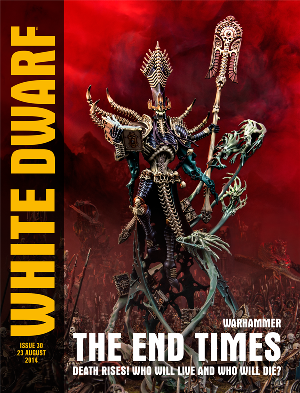 Not only is my Tomb Kings army RADICALLY affected by this new release, but in reading the issue of White Dwarf, it appears both of my other armies are about to come back into prominence. Oddly enough, this resurgence of my three armies has Nagash of all beings to thank for it. It’s a bit ironic, but I’m really excited for the new models, rules and the promise of things to come. 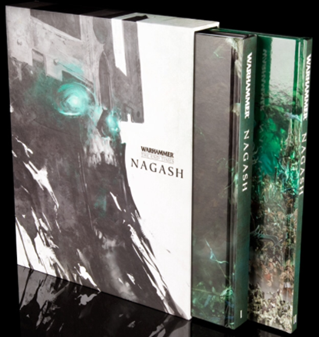 After reading Issue #30, I’m very tempted to put down money for the Nagash model, the new two volume book set and the novel The Return of Nagash. So as both a magazine and a sales piece, this issue of White Dwarf has done its job and then some. What will you find in the pages of this issue of White Dwarf past the gorgeous cover of this new gigantic Nagash hovering over an army of both Vampire Counts and Tomb Kings models? Well, a lot actually. Most of the issue does focus on Nagash though, so unless you are interested in this Lich of liches, you probably won’t find much to interest you in this issue. If you play with or against undead in Warhammer Fantasy at all though, man, you’ll want to look at this. Nagash based articles include an in-depth look at the model and the different ways you can assemble him, along with attempts to sell you on the two book Nagash set, the limited edition variant which costs twice as much (for some prints and a map), Lore of Undeath battle cards and the new novel by Josh Reynolds, The Return of Nagash. Now of course, these are all sales articles to some extent, and we’ve all made the joke at some point that White Dwarf is basically a fluffy sales pamphlet, especially with the old version. However, there is actually meat to each of these articles besides the hard sell attempt. The minatures article talks about how you can assemble him and also talks about his history in a newcomer friendly fashion. The two articles on the Nagash tomes gives a decent look at what you’ll find in each of the two volumes contained in the collection. Oddly enough, we’re gearing up for Undead vs. Chaos, where the Undead are the good guys (comparatively) and strange alliances with the Empire are being formed! We also learn that Kislev is completely wiped out (sorry those of you with olden tyme armies for that faction) and you get a snippet of one of the adventures in the Nagash campaign. Sure, the Limited Edition and Lore of Undeath articles are 100% “PLEASE BUY ME NOW” pieces, but it’s nice to see the magazine tempering the sales pitches with actual snippets of substance. Of course, White Dwarf will never be 100% Warhammer Fantasy. You also get a sales piece for the new The Talon of Horus novella collection. The cover looks swank, but I have no interest, and the article’s sales attempt will go over your head unless you are extremely familiar with Abaddon. There’s no attempt at all to sell or explain the book to newcomers or more casual fans. You also get a short sales article on the Grey Knights “Nemesis Vanguard” box set that is being released. Again, pure sales instead of an attempt to make newcomers care, which really stands in stark contrast to the Warhammer Fantasy bits. At least there aren’t any Hobbit articles in this one! After that, the magazine returns to Nagashamania. The article entitled “The End Times” is one of the best pieces I’ve seen in this magazine in terms of in-depth discussion of what is to come. We learn about the sides being formed (basically everyone vs Chaos), the final battle between Nagash and Settra, a set of creatures known as the Mortachs and some big rules changes. The rules changes are perhaps the most interesting. Now, 50% of your army can be lords, which is a real dynamic changer, although perhaps not so much for the armies field. There is also a new form of magic, The Lord of Undeath, which can be used by ANY army. Want a necromancer Skaven? You’ve got it. How about Orcs? Hey, I can do something with Orc Vamps and Zomblins that Titan Forge made and have them be LEGAL in a Warhammer game! There’s a lot of interesting bits in this article that shows how wildly The End Times will differ from the usual Warhammer Fantasy game. 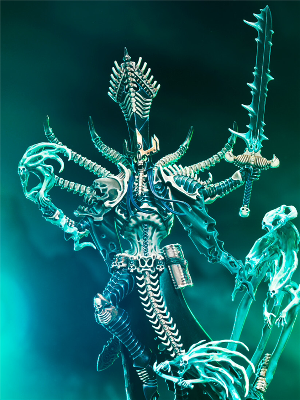 We also see that Nagash can summon triple the amount of undead troops via summoning spells, protects friendly undead within a foot of him, has a 4+ armor and ward save and some nifty magic items, including the Staff of Power, which harkens back to the old way magic used to work in Warhammer Fantasy. Overall, this entire article made me want a Nagash of my own, although that $105 dollar price tag does make him the most expensive figure (he’s not a mini, that’s for sure) for Warhammer yet. This issue’s Battle Report is about “The Humbling of Settra”, which is a scenario in the new Nagash two volume set. In the report, you’ll see Nagash take out a massive Tomb Kings army all by himself in five turns. It’s a pretty impressive battle, and it’s one of the most detailed battle reports I’ve ever seen in an issue of White Dwarf. You really get to see each player’s strategies and the effectiveness of various troops. Of course, some of you might be like, “How does a single 1,000 point creature destroy a several thousand point army? How is that not crazy unbalanced?? ?” Well, two things. The first is that there is a special “control undead” rule in effect during the battle, which means slowly but surely, undead troops switch to Nagash’s side. The other issue is that Adam put together a truly, and I mean TRULY, terrible Tomb Kings army, which helps to explain the result of this battle. I mean, this army appears to be assembled by someone who has never played Tomb Kings before. I am far from someone who would be a tourney winner, as my Tomb Kings army has always been something more to paint and look at than to win with, but I took one look at the Army list and I was like, “This is going to be massacred by ANYONE.” The army didn’t take advantage of any of the strengths or synergies that the Tomb Kings offer. It was mostly Skeleton Warriors, which was a huge red flag to begin with, the archers didn’t use Khalida (who wasn’t even fielded), there was no use of Thy Will be Done even though there were three Tomb Princes fielded, and the player went for direct physical attacks via Submerged Under the Sands, even though Nagash has a chance to control any undead within a certain range to him. Even with all these horrible mistakes by the Tomb King Army, it still took five turns for Nagash to win, and even then he BARELY won. Nagash had but two wounds left at the end of this battle, and had a proper Tomb Kings army that actually used ranged attacks (especially a massive group of Khalids led archers) been fielded, I have no doubt Settra would have defeated Nagash once again. Now, the above nitpicking of the terrible Tomb Kings army used in this Battle Report aside, I still loved this piece for three reasons. The first is that this was a really fun battle report to read. The second is that it showcases how amazing Nagash is. The third is that as powerful as Nagash is, he can still be beaten, especially by a player fielding a quality army or with some sense of strategy. This means you don’t have to worry about, “LOL Cena Nagash Wins!” like in the olden days. I’m really looking forward to trying this scenario myself with my own ranged oriented Tomb Kings army to see how it would fare. 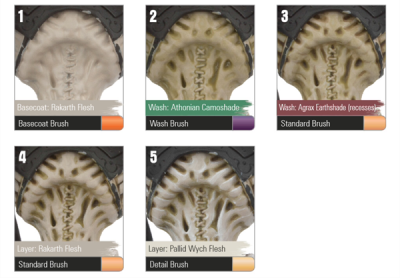 “Paint Splatter” gives you some great advice on painting Nagash. You get tips on breaking the model down into five sections and painting those separately, down to separate guides for the bones, flesh, gold, armour and robes/spirits of the piece. Each subsection has photos of the four-five shades used on each section. It’s pretty intense and extremely helpful. I really liked the advice on using the Lahmian Medium to thin paint to achieve proper shading. Shading and thinning are my two weakest areas as a painter, so this was very helpful for me. Although I’d never get my Nagash to look at stunning as the one shown throughout this magazine, the tips here will help me, not just with this model but for any undead GW miniature. After that we get “Designer’s Notes” which talks about how the new Nagash model came to be, and you even get a look at one of the original artist sketches to see how far the model has come. Just a great insight as to the history of the new Nagash. “This Week in White Dwarf” follows up the advice in “Paint Splatter” with how best to assemble and paint Nagash. “The End Times, No We Really Mean It” gives a hint that the Lizardmen might soon have a Level 5 Wizard of their own. Go Mage Priests! We also get a follow-up to an article from Issue 23 (the last White Dwarf I reviewed). Then the magazine winds down with an old school Nagash timeline, information about The Claw of Nagash, a look at why Orks have a checkerboard pattern on their armor and tanks, a few model pictures/snippets better suited for Warhammer Visions and we’re done. Man, what a great issue. This might be the best issue of White Dwarf in years! The sales pitches were kept to a minimum and the magazine was mostly what you want from a gaming periodical: quality articles, top notch advice, great photos and a real in-depth look at the new pieces, book and changes coming to Warhammer Fantasy. I have a feeling I’ll be picking up the next few issues to see just what Warhammer: The End Times will wrought on my armies and the game as a whole. If you haven’t picked up an issue of White Dwarf in some time, this is definitely the one to get. I can’t recommend this issue highly enough, as I review a lot of gaming magazines and pound for pound, this might be one of the best issues of any tabletop periodical this year (although The Unspeakable Oath, Issue #24 is right up there)!